Guatemala Travel Tips to help your friends in the USA or Europe call you by telephone or fax you. Do not expect this to work first time, this is a trial and error process until you learn how to this from your present city in your country to the city in Guatemala. You are NOT calling the USA; the USA country code is not needed. The country code for the USA is either 001 or 1, you do NOT use this, you are not calling the USA, you are calling Guatemala. 011 is the get me out of the USA number. 3. (+) Plus Sign means: Get me out of country. Get me out of the country I am in, this normally works only on cell phones and Skype.com. 4. Caribbean and Canada is part of USA telephone system. In some leap of confusion, Caribbean Islands or even Canada are treated by the telephone companies like the USA, you can dial 1 and not the complete 011, and this is confusing. 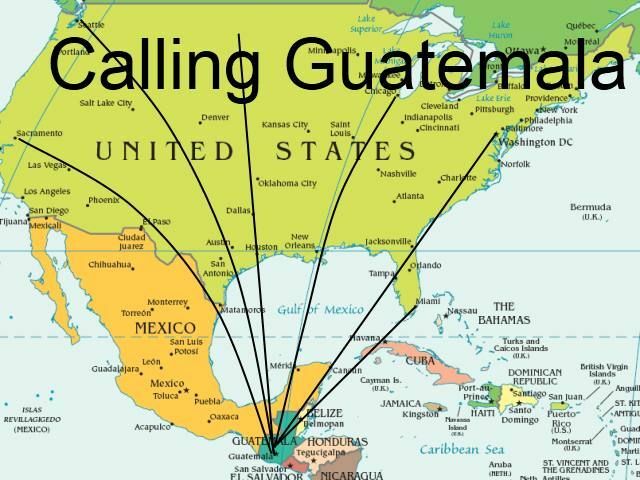 Therefore, you believe you are calling overseas, but you truly never learned to call a country like Guatemala. It cost you about 2 cents U.S. per minute to call the USA, this is the best way, forget having them call, you call them. 7. Is the person calling from a cell phone or a landline? The Plus sign should work on a USA telephone. Note, the USA telephone system is not standard with the rest of the planet, the USA system operates with many exceptions to normal rules, herein is your confusion. Send the full number if they are using a landline. 9. Call them and make them repeat the telephone number. When they are writing a number down, they must repeat it, and then you repeat it. Then you make them repeat it again, if they do not, they are too lazy, you need to call them. 10. Caller ID, this allows them to call back. I have a USA number, when I call the USA, this number shows up on the persons caller ID, they click on this and after about 20-30 rings it is forward to Guatemala. 13. Call 0 and beg for international calling help. 14. Spouse of person who husband or wife works outside the USA. Soldiers, Government Officials, there are people in the USA whom have spouses who work outside the USA. A Magic Jack is used by many people outside the USA, but requires you have a very fast internet connection. If you have a current version of Yahoo Messenger, you can all YM to YM for free. 18. Do not call overseas, this is a solution. 19. Persistence, tell the person who call, they need to try about 20 times with different ways, they need to think, if they only try one time, if they are lazy, this is not going to work. If you are doing business with a person or company that is not capable of understanding how to do all the thinks above intuitively, than you need to cut them loose, and find better-qualified people.